I've been asked quite a few times where I find inspiration for my recipes and the truth is, it comes in various guises. Sometimes it'll be the desire to experiment with a new ingredient, the ripeness of an in-season ingredient, a craving for a particular flavour, an attempt to recreate a healthy version of an old favourite, the weather, a special memory.. the list is endless! 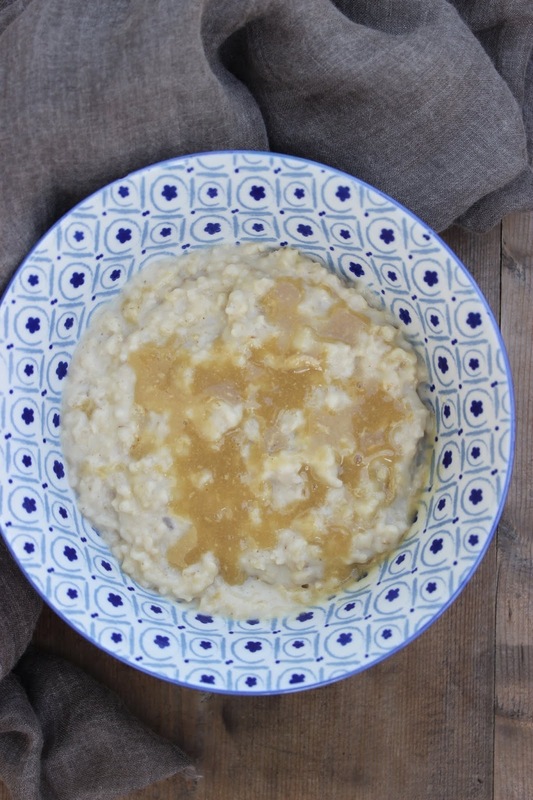 Today's recipe inspiration actually came about through a random internet scroll where I learnt that it's World Porridge Day! I know such days can cause a certain degree of eye rolling but it's no secret that I do love a theme and this, together with the temperature dropping and the fact that I really do believe that everyone can love porridge if they just discover the right way of serving it, meant that I couldn't ignore the opportunity to celebrate this nutritious breakfast! This Salted Caramel Porridge is the perfect celebration- it's indulgent and ideal for autumn. 1) Combine the oats, almond milk and vanilla in a small saucepan. Cook over a medium heat on the hob, stirring regularly, until most of the liquid is absorbed and the mixture is thickened (approx 5-10 minutes). 2) Meanwhile, whisk together the maple syrup, tahini and salt in a small bowl until the mixture resembles a smooth caramel sauce. 3) To serve, divide the porridge between two bowls and top with the apple and a swirl of the caramel sauce.